The Leadership Conversation | Arizona Center for Civic Leadership | Shaping tomorrow together. Won’t you join the civic leadership conversation? Civic leaders look to many sources for solutions to the problems of the day. In the posts below, public and private organizations present new options; program evaluations show what works; and collaborations demonstrate how change can happen. Leadership Academy. This is the fourth class to participate in the Academy, an initiative of the Flinn Foundation in Phoenix and the Thomas R. Brown Foundations in Tucson. With now over 100 Arizonans participating in the initiative, Flinn-Brown Fellows can be found all over the state, including Kykotsmovi, Flagstaff, Jerome, Cottonwood, Goodyear, Mesa, Tempe, Phoenix, Vail, Tucson, Safford, and other cities and towns in between. Fellows also continue to represent a wide array of perspectives, walks of life, and employment backgrounds. The newest class includes leaders from Arizona’s business, industry, nonprofit, education, and government sectors—including current and former local elected officials. The Flinn-Brown Academy, the flagship program of the Arizona Center for Civic Leadership, was created to help prepare and support Arizona’s future state-level civic leaders who wish to serve—whether full-time or part-time, paid or unpaid—as a member of a state board, commission, or advisory council; an elected official; a state government executive; or a policy advisor. The Academy is comprised of a 12-session seminar series that helps participants develop a better understanding of Arizona’s most pressing public-policy issues, as well as the skills required to take the next steps into state-level civic leadership. Beyond the seminars, the Academy includes advising from a private- or public-sector leader, an individual plan for civic leadership in Arizona, an alumni network, and continued learning opportunities. The nonpartisan Academy’s content is based on the critical issues facing Arizona. Public-policy experts, scholars, current and former agency heads, elected officials, and other leaders—drawn from the public and private sectors—share with Fellows not only facts and figures, but also a wide variety of perspectives and leadership skills. The class was selected in a highly competitive process that involved a formal application, along with an in-person interview. The Leadership Council of the Arizona Center for Civic Leadership made the final selection of Fellows. The group will begin the Flinn-Brown Civic Leadership Academy on September 7. Interested in participating in the Academy? The Academy seminar series is presented in the fall and spring each year. The application process for the Spring 2013 cohort will open later in September, and the Fall 2013 application process will open next March. See azcivicleadership.org for updates about both upcoming classes and subscribe to the free e-newsletter. Attorney, Peñalosa & Associates, P.C. Though Stefanie Mach is a partner at the nonprofit and political consulting firm CM Concordia and has worked for nonprofit organizations in various capacities, interned at the Embassy of Peru, worked in Senator Russ Feingold’s office, and even had her own weekly radio show on politics, she did not seriously consider running for office before her experience as a Flinn-Brown Academy Fellow in 2011. Currently a candidate for the Arizona House of Representatives in Legislative District 10 (Tucson), Mach has been busy going door-to-door talking with her neighbors about their concerns and Arizona’s most pressing issues. We recently caught up with her to find out how she came to the decision to run. When Stefanie Mach sat down with her Flinn-Brown Civic Leadership Academy cohort last Fall and began listening to seminar presenters, it didn’t take her long to see that she was with an impressive group. “I was in a room full of people who were dynamic, knowledgeable, and accomplished. They were professionals with prestigious titles. They were from every corner of the state and had all types of life experiences,” she said. Interested in learning how you, too, can contribute your unique set of experiences to state-level leadership? 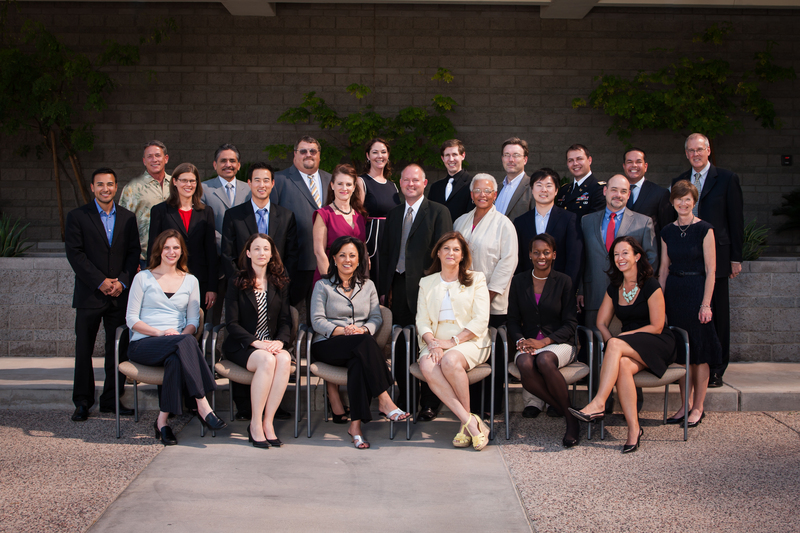 The Arizona Center for Civic Leadership will begin accepting applications for the Spring 2013 Academy this Fall. Subscribe to Civic Leadership News to be notified as soon as applications open. Throughout the celebrations marking Arizona’s Centennial, many have wondered about how the next generation of civic leaders can prepare for the future. The third class of Flinn-Brown Civic Leadership Fellows has been busy thinking about that same thing and planning their leadership contributions to Arizona’s next century. This group of 24 Arizonans from Safford to Flagstaff is committed to helping address the state’s long-term issues and improving the quality of life for future Arizonans. They recently completed an intensive seminar series, the first component of the Flinn-Brown Civic Leadership Academy. The Fellows devoted hundreds of hours to learning about policy topics ranging from such issues as the state’s fiscal system to the economy, human services, border issues, and water. These Arizonans represent a wide range of outlooks, career paths, and urban and rural regions. Among them are leaders in business, education, and health policy, nonprofit executives, local elected officials, policy professionals, attorneys, an army ranger, and an Emmy-winner. While their experiences and views vary, all of the Fellows have shown a strong commitment to serving their communities at the state level and to acquiring the policy and civic leadership skills needed to make a difference. Each daylong seminar included detailed presentations and question-and-answer sessions with state agency heads, veteran lawmakers, business and nonprofit leaders, and policy experts. The assistance and commitment of the speakers extends far beyond the seminar, according to Dr. Deborah Gonzalez, a Fellow who serves as chief academic officer of the Arizona State University Preparatory Academy in Phoenix. “The program presenters have made themselves available outside of the Academy. They’ve been more than gracious in reaching out to help and mentor us informally,” said Gonzalez. As part of the seminar, Fellows also participated in a policymaking exercise. They worked in committees that focused on a tough issue facing Arizona today, such as math readiness for high school, the state’s fiscal system, or road infrastructure and funding. The committees studied the issues and collaborated to create policy recommendations. They presented their findings to high-level civic leaders at the final Academy seminar. The seminar series is only one element of the multifaceted civic leadership program. Fellows continue to receive guidance and support from an advisor who is an experienced state-level civic leader. “I’m hoping that my advisor will help me think through the logistics of beginning a grassroots effort that has legs,” said Gonzalez, who hopes to implement a community effort that will better support parents and impact the larger communities surrounding schools. Britann O’Brien, director of the Southern Arizona office of Governor Brewer, is passionate about rural Arizona and the challenges and opportunities presented in border communities. As a Flinn-Brown Fellow, she found the collaboration among civically engaged peers from a range of backgrounds invaluable. “Meeting other future leaders from a huge cross section of people from all over the state has resulted in relationships that I know will continue far into the future,” said O’Brien. The Flinn-Brown Leadership Academy is geared toward Arizonans who want to be state-level civic leaders as elected officials, members of boards and commissions, policy advisors, or state agency executives. It is one of three core components of the Arizona Center for Civic Leadership, created in 2010 by the Flinn Foundation and co-sponsored by the Thomas R. Brown Foundations, respectively based in Phoenix and Tucson, Ariz. The Center is administered by the Flinn Foundation under the guidance of the Center’s Leadership Council. The fourth Flinn-Brown Civic Leadership Academy will be held in the fall, beginning in September. The selection process, which began with submission of formal application portfolios, is now underway. Approximat ely one out of four Arizonans is 50 years of age or older. Interest is increasing among this experienced group in “encore” careers—new activities that combine personal satisfaction with social impact. The Virginia G. Piper Charitable Trust has created the “Encore Prize” to reward nonprofit and public sector organizations that are leading the way in engaging older adults in social purposes. The Piper Trust will award up to three $5,000 prizes to organizations. Plus, one of the three may receive a $50,000 Encore Enhancement Prize to expand their use of 50+ talent. The deadline for application is June 29. See www.pipertrust.org/encore for more information. 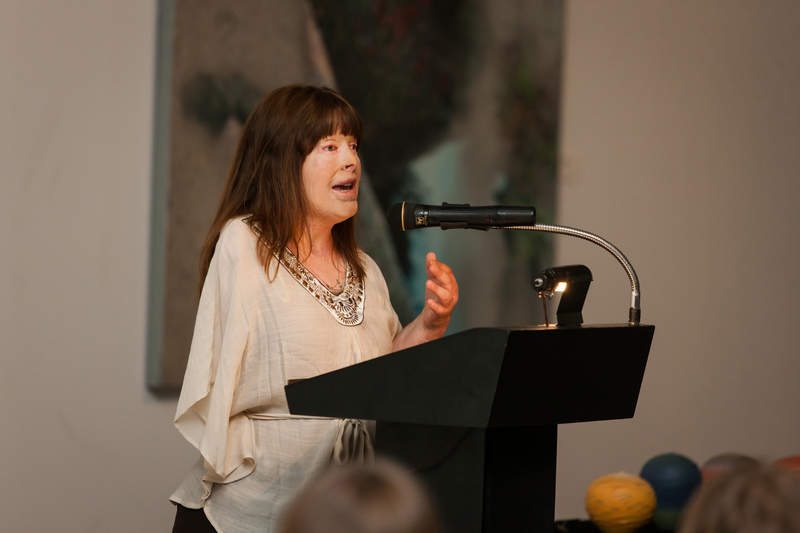 In 2009, the Piper Trust helped to launch Experience Matters, an initiative to connect 50+ adults with social purpose opportunities, led by Flinn-Brown Fellow Nora Hannah. Nora works daily to recruit, train, and place experienced Arizonans (mostly Baby Boomers right now) with nonprofit or civic organizations in need of their expertise. This deep reservoir of talent is expected to pay dividends for communities as experience in one field is transferred to others to serve the greater good. See www.experiencemattersaz.org to learn more about opportunities with Experience Matters. 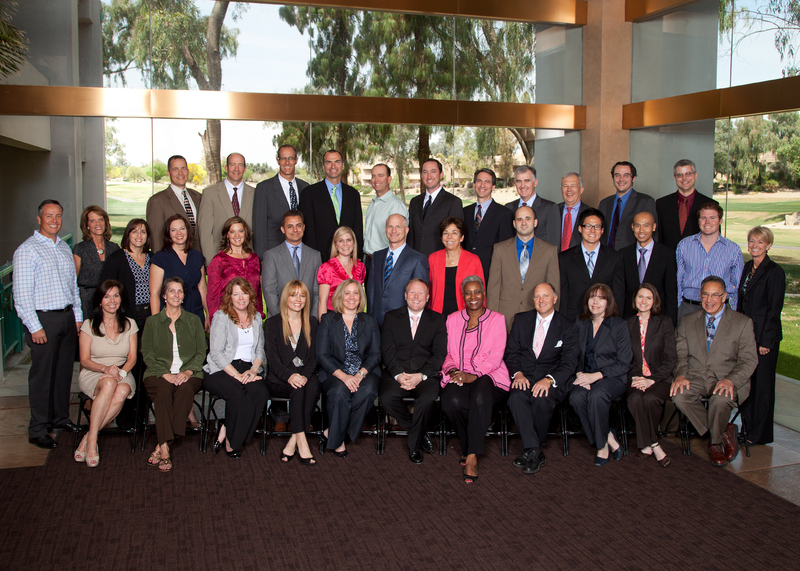 Congratulations, Scottsdale Leadership Class XXVI! Scottsdale Leadership, Inc., a nonprofit community leadership program serving the Scottsdale area for more than 25 years, recently announced the graduation of Class XXVI. Thirty-six individuals participated in thought-provoking discussions covering issues facing Scottsdale. Other experiences in the program included a helicopter tour of SRP’s dams and a full day of police and fire training. Scottsdale Leadership graduates go onto tackle community issues, lead nonprofit organizations and seek public office. The graduation was sponsored by Casino Arizona / Talking Stick Resort and General Dynamics. Michael Corso, PCI Associates, Ltd.
Tim Garvin, City Property Management Company, Inc.
Kiem Ho, Henkel Consumer Goods, Inc.
Joe Holmes, ATC Associates, Inc. Heather Husom, Hello Arizona! 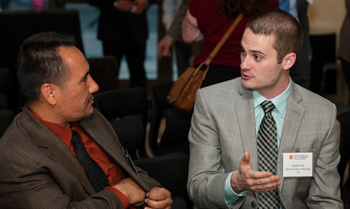 Inc.
Chris Rivera, DMB Associates, Inc.
John Ware, RJR Surveys, Inc.
Dustin Cox (right) talks with Flinn-Brown Civic Leadership Academy classmate Fernando Shipley. Dustin Cox, president of CM Concordia Consulting, is a 2004 Flinn Scholar and former executive director of Anytown America and Anytown Arizona, nonprofits offering nationwide leadership development programs. A year ago, Cox was completing the inaugural Flinn-Brown Academy seminar series. Today, he’s running for Arizona state representative in Legislative District 9 (Tucson). We pulled him off the campaign trail for a few minutes to reflect on his experience with the Flinn-Brown Academy and its impact on his current Arizona leadership endeavors. This level of exposure, Cox believes, has made him a much more informed candidate in his current run for office. “I can speak with so much more authority and confidence on water policy, for example,” he said. The water seminar covered legal history, the future challenges Arizona faces as a desert state, and the collaboration required among municipalities, tribes, states, and federal organizations. “I do not know of any other state program that provides such depth and breadth of information to potential state-level civic leaders,” he said. Applications are now open for the Fall 2012 session of the Flinn-Brown Civic Leadership Academy. Application portfolios are due by 11:59 p.m. on Friday, May 18, 2012 (Please note this new extended deadline). A brochure with detailed information about the Fall 2012 Academy, which will run from early September to mid-November 2012, is available for download. After reading the brochure, you may begin building your application portfolio here. A sample application is available at: http://www.scribd.com/doc/92013883/Sample-Academy-Application-Fall-2012. From full-time professional to part-time volunteer, there is a place for all Arizonans in civic life and civic leadership. The Flinn-Brown Civic Leadership Academy helps to expand the cadre of future state-level civic leaders with the knowledge, skills, and commitment to address Arizona’s long-term issues. The Flinn-Brown Academy is designed for Arizonans from the private- and public-sectors with a strong interest in engaging at the state-level as a member of a state board, commission, or advisory council, an elected official, a state agency, or a policy advisor. The non-partisan Academy supplies Flinn-Brown Fellows with the facts and figures required to better understand statewide policy issues and different perspectives, and strengthens leadership skills to achieve goals for the common good. The Academy includes 12 day-long sessions in which Flinn-Brown Fellows learn from presentations by dozens of influential issue experts and current and former leaders, explore case studies, and engage in practical skills development. The Academy also features invaluable opportunities to network with other emerging and established leaders. As part of the Academy, Fellows are matched with advisors whose civic leadership experience can help the Fellow further develop their capacity for state-level civic leadership. With their advisors’ support, Fellows develop personalized individual civic-leadership plans. The strongest applicant for the Flinn-Brown Civic Leadership Academy…. Possesses a keen desire to be a state-level civic leader in Arizona. Is committed to civic involvement personally and to encouraging civic engagement among Arizonans. Has a significant interest in state-level public-policy issues, analysis, and solutions. Shows interest in and has the capacity to consider different perspectives and make fact-driven decisions for the common good. Exhibits the ability to be an effective leader, as seen in a combination of current or past work experience, business, volunteer, school, or church activities, civic activities, issue advocacy, or local elected office. Has taken other preparatory steps to becoming a civic leader, such as participation in a local or regional leadership-training program. The program is not intended for those who are already state-level elected officials or paid staff members of a political party. To begin the application process for the Flinn-Brown Civic Leadership Academy, a candidate compiles an application portfolio, which is submitted online. All applications will be reviewed by a Selection Committee. The committee will identify a group of candidates to be invited to the Flinn Foundation for a personal interview. If you need more information, have any questions, or do not receive an email confirmation after submitting an application, please contact AzCCL program manager Emily Rajakovich at erajakovich@flinn.org or 602-744-6828. In a state where the majority of residents are migrants from elsewhere, how much does Arizona’s history matter? On February 7, a week before the centennial of Arizona’s statehood, Zócalo will host a public event in Tucson to delve into the question. Jack B. Jewett, president and CEO of the Flinn Foundation, will serve as moderator for the free event, which will be held at the Hotel Congress at 6:30 p.m.
Tom Zoellner, author of A Safeway in Arizona. How are these people who pulled up stakes and changed the course of their personal histories to become Arizonans influenced—if at all—by the events that preceded their arrival? One hundred years ago, Arizona emerged as a state after a two-decade-long struggle to convince Congress that its citizens were “American” enough. Did the way it joined the union shape its present-day culture? Reservations for the event, and more information about it, are available on the Zócalo website.